Prime Minister Tony Blair has urged British academics to abandon discussion of a boycott of Israeli universities. 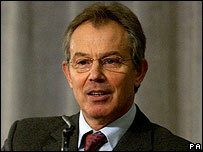 At Prime Minister's questions, Mr Blair told the Commons it would do absolutely "no good for the peace process". Last week, members of the University and College Union agreed to further debate plans to cut all links with Israeli academic institutions. Union members expressed concern over the treatment of the Palestinians in terms of accessing education. Mr Blair agreed with Labour MP Andrew Dismore, who said the boycott was "misguided" and "undermined academic freedoms" and contributed "absolutely nothing to trying to bring peace to the Middle East". Mr Blair added: "The only solution ultimately is to relaunch the framework for a negotiated peace with a two-state solution at the heart of it and that is what we will be working on in the time to come." At its annual conference, members were urged to consider the "moral implications" of links with Israeli universities. Ahead of last week's debate, UCU general secretary Sally Hunt had urged delegates not to support the boycott call. Ms Hunt said she did not believe the majority of UCU members supported an academic boycott of Israel. But delegates voted in favour of a motion to further discuss an all-out boycott. The motion was carried in a card vote by 158 votes to 99, with 17 abstentions.